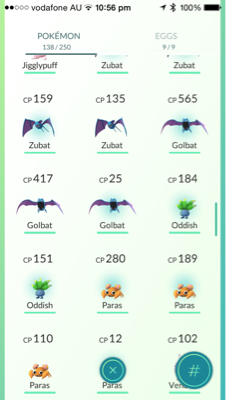 I was transferring a bunch of Pokemon recently, and I noticed that some of the Pokemon had blue aura's around them. What do these auras mean? Blue auras mean the Pokemon in question was captured recently (likely 0-24 hours old). This confers no bonus and has no advantage or disadvantage. You can verify this yourself by sorting all Pokemon by capture time. All the blue Pokemon will be at the top. Does the blue highlight indicate anything? How can I identify a raid boss Pokémon from a regular one in my Pokémon bag? What is the difference between the dashed and solid attack bars? what is wrong with my pokemon go app? Why would a Pokemon have the incense glow? What does an aura around a selection icon mean? What does it mean when a Pokéstop has a white ring around it?